On the last day of Third Euroscience Open Forum (ESOF-3), participants gave particular attention to developing countries. In the morning, a Building Networks session – titled ‘How to Support Science Journalists in Developing Countries’ – was organised by German Science Journalists’ Association (WPK) with a panel including Jan Lublinski (Chair) of WPK, Nadia El Awady of Arab Science Journalists’ Association (ASJA), Egypt, Gervais Mbarga, University of Yaounde Cameroon, Valeria Román from Clarín of Argentina, David Dickson from SciDev.Net and Diran Onifade of the African Federation of Science Journalists. David Dickson’s presentation on the role of SciDev.Net in promoting science communication capacity-buildings in developing countries was paid particular attention. The panels first presented the situation. While science journalism remains a big challenge in the developing world, there has been a major progress. More than 20 science journalism associations have been built or being done so; there have been two SjCoop (science journalist cooperation) by the World Federation of Science journalists (WFSJ); and there are regional science journalism federations. A group of science journalists in Africa, Latin America and Asia have risen up to be internationally famous. But the situation remains serious, and participants discussed there is need to better fit the need of the developing countries, the efforts between the developed world and the developing countries to tweak together are to be diversified and the science communication workshops in developing countries must be better evaluated. One particular question is if the general situation of developing countries cannot be changed – say, the attitude of editor who continues to refuse science reporting – how can we evaluate the effect of science journalism capacity-buildings in these countries. In the afternoon, the Bosch Foundation gave a summary of the feedback it has received from the journalist fellows it brought to ESOF. Participants said there should be more sessions on the developing countries. They also talked about the difference between ESOF and AAAS’ annual meeting, saying the latter has a wider worldwide perspective and a more professional public relations team. In my presentation, I suggested that we cannot ignore Europe and developing countries. It is ESOF. So we should have more sessions on the role of Europe in helping the developing countries. The five-day ESOF meeting ended without big celebrations, but attracted nearly 2,000 participants. 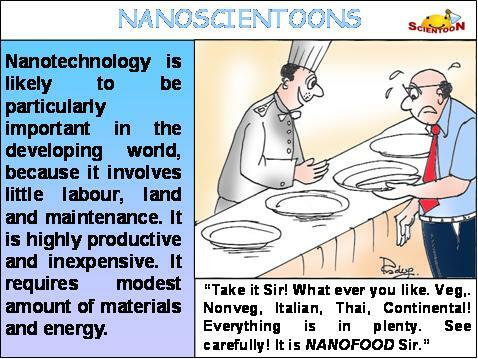 This is a scientoon – a cartoon on science and technology that helps you look at science with a dose of humour. ESOF 2008 devoted an entire session on scientoons that have emerged as an innovative way to spread science messages. For a non-scientist who may just have a passing interest in a specific scientific topic, scientoons are a way to grab their attention and put a piece of information across quickly. The ESOF session on “Scientoonics : a novel way to learn science having fun” was put together by a group of ardent ‘scientoonists’ from India: Manoj Patairiya from the National Council of Science and Technology Communication (NCSTC) in Delhi; Pradeep Srivastava from the Central Drug Research Institute in Lucknow; and Abhay Kothari, a designer in Ahmedabad. For ‘scientoonists’, their art is not only about making a caricature that draws a smile but also provides information about new research, subject, data or concept in a jiffy. So a scientoon is slightly different in its structure from a cartoon. A cartoon has two elements: a caricature and a satire at the bottom or in the form of a balloon. A scientoon has an additional third element: a box that contains the science information that needs to be communicated. And the scientoon need not be confined to a print magazine or daily. Or for that matter a research journal or a popular science magazine. India’s NCSTC has produced radio skits on science or ‘radio scientoons’, puppet shows on science or ‘puppet scientoons’ and ‘multimedia scientoon’ on the internet and video. It is now trying to develop theme-based scientoon strips, films, books to suit a variety of audiences, including persons with special needs, such as ‘Braille scientoon’ for the visually challenged. So just let your imagination flow and begin your scientoon. Dr. Manoj Patairiya is a science writer based in New Delhi. It turns out that while the Indian government has tied itself into knots explaining the Indo-US nuclear deal to Indian political parties, and is seeking a vote of confidence in the Parliament right now, at least some International Atomic Energy Agency (IAEA) officials seem to be a little more relaxed. “I have not yet read the document,” commented Diane Fischer, senior safeguards analyst at IAEA, after a presentation on Monday (July 21) at the Euroscience Open Forum on how the agency tracks nuclear smugglers. A bit surprising given that entire rules are being re-written in the deal, and one would have expected at least some passing academic interest from IAEA officials in the matter. Fisher was asked by Indian journalists about whether certain IAEA conditions on broader access to nuclear facilities apply to India-specific safeguards in the nuclear deal signed between the two countries in March 2006. Since then, and even weeks before the signing, there has been much debate in the country about India-specific clauses in the deal, which basically allow India, which has not signed the nuclear non-proliferation treaty to buy nuclear fuel from the US for its civilian reactors. This would normally have not been permissible under the US Hyde Act. After many a hand-wringing among strategic and nuclear science analysts over the India-specific clauses and umpteen changes in the text, officials from India’s Department of Atomic Energy went to IAEA headquarters in Vienna last week to seek approval of the deal. The board of governors at IAEA will meet on August 1 to decide on the issue. Back home, the coalition government in India tottered, with the Communist parties withdrawing support to the coalition government. At the time of writing the blog, the result of the Indian parliamentary debate and vote of confidence is yet to be out. And looks like not all IAEA safeguard officials are aware of what the document holds. Here is (rather was) a case straight from an Agatha Christie mystery, ripe for a Hercule Poirot or Miss Marple to step in and solve, at least the way a nuclear forensic scientist Klaus Mayer, from JRC’s Institute for Transuranium Elements (ITU), narrated it at the Euroscience Open Forum in Barcelona on Monday (July 21). A telephone call about 14 pellets of radioactive material in a garden in Germany last year. Who put them there, where did they steal it from and what sinister task were they meant for? A crack team of ‘atomic detectives’ in Germany started unravelling the mystery. They were specialists in nuclear forensics that forms the backbone of nuclear safeguards and tracking illicit trafficking of nuclear material, both causes of rising global concern. But back to our Christie mystery first. The pellets were sent to the European Commission’s Joint Research Centre – at 6.30 p.m. local time in the evening, apparently a good time for the police to send radioactive pellets to a laboratory. It triggered a nuclear forensic investigation to identify the origin of the material and its intended use. A series of tests on the samples’ compositions, isotopes present, structure, impurities and products formed after radioactive decay gave vital clues. The pellets contained 3.5 percent enriched uranium. It was relatively pure uranium – the degree of purity a clue to the kind of facility used. The pellets contained some fine markings on one surface and digits on the other – again a clue to the kind of reactor used. The overall conclusion was the pellets were rejects of quality control procedures. More investigations and more clues. The findings were referred to an international database to check when the pellets were last purified and separated. So the pellets were diverted from the atomic plant after sintering and gravity. To cut a long story short, this one had a harmless ending. The pellets were from a German reactor. And the garden owner was under psychiatric treatment, a drug addict who ended with the pellets during some drugs dealing and decided to come clean through a telephone call. It is not clear how or since when nuclear pellets are being traded for drugs, but maybe that can be addressed some other day. But India can vouch some strange things do happen – way back in the 1990s, a disgruntled employee at an atomic power plant near Chennai (former Madras) took away some rods of radioactive material and dumped them in the Cooum river in the city to express his irritation!! An organiser of a world’s major programme to help developing countries’ researchers access international journals agrees there is a need to make adjustments. At the third Euroscience Open Forum (ESOF-3) in Barcelona, a session on “Bridging the Digital Divide by 2015”, chaired by SciDev.Net director David Dickson on July 19, discussed how HINARI, AGORA and OARE, three unique public-private partnerships, are working in line with the UN’s millennium development goals to provide the developing world with access to critical research. HINARI or Health Information Access to Research Initiative provides online access to one of the world’s largest collections of biomedical and health literature. Under the leadership of the World Health Organization (WHO), over 5,000 journals are available to health institutions in 108 countries, benefiting many thousands of health workers and researchers. AGORA, or Access to Global Online Research in Agriculture (AGORA), enables developing countries to gain access to information in the fields of food, agriculture, environmental science and related social sciences. AGORA provides a collection of 1,275 core journals to institutions in 108 countries. OARE, or Online Access to Research in the Environment (OARE), enables 108 low income countries to gain free access to over 2,000 environmental sciences journals. Thousands of developing country researchers, such as Mohamed Jalloh from General Hospital of Grand Yoff in Senegal, a panel speaker, have benefitted from the programme. Sir David King, former scientific adviser to the UK government, dismisses fears that asking developing countries to cut their carbon emissions is a plot to curb their development. At a media briefing on 18 July at the third Euroscience Open Forum (ESOF-3) in Barcelona, King, currently director of the Smith School of Enterprise and Environment at Oxford University, warned that climate change mingled with population explosion, would bring a series of global challenges, ranging from food and energy security to increased terrorism. The world must rise up now to act against climate change by reducing emissions, he said. He also pointed out that levels of permissible emissions considered safe to the environment were not decided by politicians and negotiators, but by scientists at IPCC who have reached global consensus. “It is not European nations which pressure on China’s development by asking it to reduce emissions. This (pressuring) is mainly done by the United States, which until now did not accept any emission reduction obligation. So it is not a plot at all,” King said. A leading Chinese scientist has appealed to European nations to adopt a more positive attitude on genetically modified (GM) food because their views affect policies in countries such as China that urgently needs to decide on whether to commercialise GM crops to feed its hungry people. “The attitudes of the Chinese policymakers are deeply influenced by your views and I appeal to you to reconsider your stance so that modern agricultural technologies can benefit more people in the developing countries,” says Yang Huanming, director of Beijing Genomics Institute and one of China’s leading scientists in human and rice genomics. Huanming was speaking at a 18 July session organised by European Action on Global Life Sciences (EAGLES) at the ESOF meet in Barcelona. Yang’s remark was made days after the Chinese government approved of a huge genetic engineering project to improve plants’ nutrition, and their tolerance to drought and floods. Details of the research project have not been revealed, but the official China Daily reported the funding for the long-term research programme (2006-2020) could be up to 20 billion yuan (US$2.92 billion), with about 20 percent of the funds used for biosafety inspection and infrastructure construction. Yang believes that the big research funding programmes will make the approval of GM crops – especially GM rice , several varieties of which are under pre-commercialisation trials in China – easier. “The big research programme, plus the softer attitude of some European leaders on GM crops, may push ahead the application of GM technologies, but there are not without barriers,” Yang says. He told SciDev.Net that one of major barriers is fears on biosafety raised by the environment organisations such as Greenpeace, which he described as a “export” from Europe to China. “They say the majority of Chinese agricultural products will be polluted by the modified genes and so this will seriously influence Chinese exports to Europe,” Yang says. “This claim is threatening enough to some policymakers although there is no scientific evidence for the “gene pollution”. David McConnell, a professor of biotechnology at Trinity College Dublin and co-vice chairman of EAGLES, welcomed Yang’s appeals, saying the voices from the developing world would help scientists in Europe deliver more correct approaches, such as the scientific basis of GM foods, to the European public. “The widely cherished GM-free organic farming in Europe relies on huge government and financial supports and cannot be realized among small farmers in the developing countries who urgently need modern agricultural biotechnologies to improve their productivities and reduce their inputs,” McConnell told SciDev.Net. You are currently browsing the archives for the ESOF 2008 category.